Summary: Can Danny and his father outsmart the villainous Mr. Hazell? I am so excited to announce that I was chosen as a Roald Dahl featured blogger this month! Roald Dahl stories have been HUGE this year in my son's fourth grade classroom, and I think it's a wonderful opportunity to celebrate an author who has mad such a difference in children's lives! 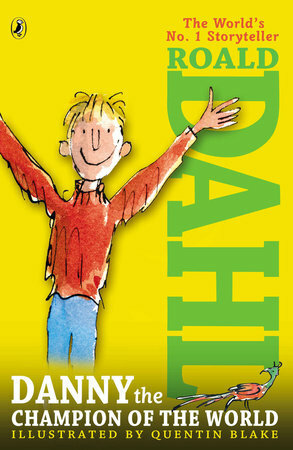 I can't say that I've read many or even most of Mr. Dahl's books (because there are so many! ), but I did read a few as a child. Over the past couple of years, I've decided that I should read stories from Dahl, "the world's no. 1 storyteller." So I read MATILDA -- you can read my review here, and just this week, I read DANNY THE CHAMPION OF THE WORLD. Next up for me -- MISCHIEF AND MAYHEM! DANNY THE CHAMPION OF THE WORLD tells the story of Danny and his father. Danny is a very happy kid who adores his father. He lives in a gypsy caravan and works with his father as a car mechanic. But the best thing of all is the way his dad creates wonderful stories for Danny every night. One evening, Danny wakes up and discovers that his dad is missing. Danny's father then reveals a big secret to him... one that he has been hiding for years. Danny is thrilled to be included and soon creates an intricate (and very creative) way to help his father against the very mean Mr. Hazell! If Danny and his father succeed with Danny's plan, then Danny will definitely be "the champion of the world!" DANNY THE CHAMPION OF THE WORLD is an adorable book by Roald Dahl. I probably don't need to say much more than that! It's fun and silly and even a bit exciting, and I think kids will relate to both Danny and his father. There is enough of a mystery to keep kids turning the pages, and the illustrations by Quentin Blake are, once again, fantastic. They really complement the whimsical nature of the story! But what I enjoyed the most about DANNY THE CHAMPION OF THE WORLD was how it focused on the amazing relationship between a father and a son. It was clear that Danny adored his father and definitely wanted to impress him. However, I'm pretty sure that Danny's father felt the exact same way. These two had a special bond that definitely warmed my heart. DANNY THE CHAMPION OF THE WORLD was a terrific read, and I'm positive kids will love it. In fact, my son mentioned to me that one of the boys in his class presented his book report on this story, and the kids had a very positive reaction. High recommended! 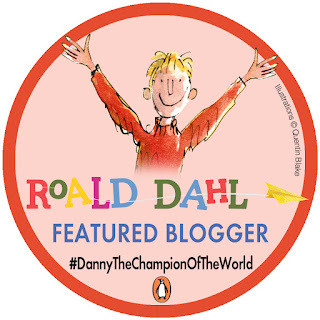 Giveaway alert: I have a copy of DANNY THE CHAMPION OF THE WORLD plus some Roald Dahl themed goodies including posters, postcards, and a notebook. To enter, just fill out the form below before July 8th at 11:59 p.m. EST. I will randomly select and notify the winner the following day. This contest is open to those of you with U.S. addresses only. Good luck! I've read quite a few of Dahl's books and haven't even heard of this one and it sounds really good. Thanks for the giveaway! Sounds wonderful! I have greatgrandsons who would love this.